I have been trying to determine what micro SD class and speed to use for the operating system that get the maximum performance from the Raspberry model 2 & 3. Since I could not find a good answer I tested several SD cards in both the model 2 and model 3. Below are my results. Note that there is an increase in the Pi performance until the fastest SanDisk Extreme PLUS card. It is strange that there is no increase in NOOBS install speed when the Windows write speed increased by 50%. The read speed is about the same in the two devices but the write speed increased by more than 50% from 50MB to over 77MB. I would expect that there would be some improvement in the NOOBS install since most of the SD operations are writes when installing the operating system. This leads to either the maximum SD interface is limited to about 40MB or NOOBS is not making use of the increase performance. I have not yet written or found a SD benchmark that run on the raspberry so I can measure the actual SD performance. Last edited by RussABarr on Mon Apr 18, 2016 1:59 pm, edited 3 times in total. the UK almost as remarkable as the De Havilland Mosquito and the Colossus. A benchmark software already exists. ...and paste the text in, then save with Ctrl-X, Y, Enter. UHS-1 and HC-1 microsd 32GB or larger 40MB/s are the optimal sdcards for the pi3. is it safe? with any card? As the Bench mark shows 40MB is about the Maximum transfer speed. Since the maximum read speed of the Samsung U1 is about 48MB this card reaches the maximum transfer rate. The Write spec for this card is about 22MB about half the maximum Pi capacity. The better performing card on write would be the Samsung Pro U3. It has both a read and write speed over the 40MB limit of the Pi. No. it has to be HC-1/UHS-1 or higher (like what you see here...U with a 1 or higher, or HC-I or higher). I experienced a huge increase in usability going from Sandisk Ultra to Samsung EVO+ which happen to be on sale at Best Buy for $20 for 64GB or $44 for 128GB. I'd say yes, edo1. My PNY UHS-1 card seems fine after the overclock. 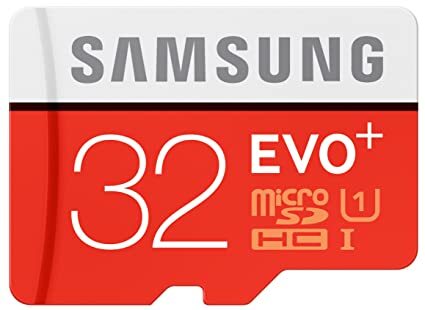 Has anyone compared the Samsung Evo+ 128GB/ 64GB to Samsung Evo+ 32GB. If they have the same page size I would expect the 4K write to be the same.